For more than five years, CAMERA has been documenting, exposing and correcting what we call “Haaretz, Lost in Translation,” an ongoing phenomenon in which the paper’s influential English edition, a critical source of information for international policy makers, journalists, researchers and students, downplays information appearing in the Hebrew original concerning Palestinian militancy, violence and other Arab wrongdoing. In some instances, the English account is completely at odds with the original Hebrew, and includes misinformation about Israel which did not at all appear in the Hebrew article. CAMERA’s Hebrew site, Presspectiva, has also frequently published about the translation problems, making the Hebrew-speaking public aware of the misinformation that Haaretz purveys in English around the world. The influence that Haaretz in English enjoys abroad is completely disproportionate to its marginal readership in Hebrew at home. In recent days, the Israeli public, along with the Hebrew media and politicians, are taking notice. 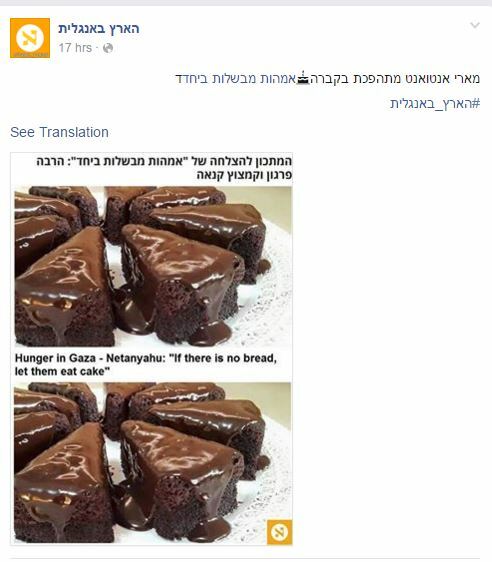 The Haaretz translation problems have become a hot topic in Hebrew social media, where memes are circulating making fun of the absurd translations. Gilad: There is a feeling, I am really trying to tone down my feelings about your paper, that you’ve adopted in some manner the Palestinian technique, but with an interesting twist. The Palestinians speak nicely to the English world, and when they speak to their audiences, their speech is ugly. You do the opposite. In Hebrew, you speak moderately, but when you speak to the outside world in English, you say terrible and horrible things. Benn: I don’t think so. I don’t think so. Gilad: I will show you, for example. 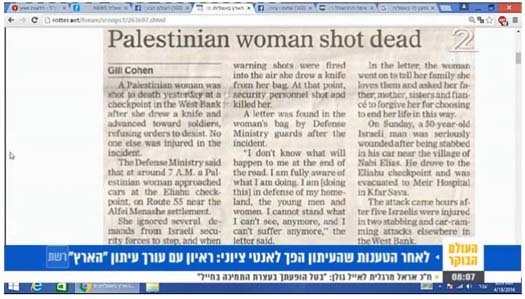 “Palestinian woman shot.” [In English.] She was, as it happens, a murderer, but in your paper she was just, ah. “How many executions by Israeli soldiers have not been captured on film”? [In English] And the like. Benn: Listen, I don’t think it’s. . . It’s true there is an organization which specifically works to find these types of errors. Gilad: Thank goodness there is. Benn: Very good. Once we were attacked that the English edition deliberately titled rightward to curry favor with Yisrael Hayom, which used to print our paper in their printing press. Listen, if there are factual errors, and we’re informed of them, we correct. There is no policy to appeal to a certain audience in the world in order to harm Israel’s hasbara or something like that. Gilad: Your publisher says, in his words, that he supports the boycott movement against Israel. Benn: No, my publisher wrote a letter, a column, in which he spoke about the advantage of the international pressure on Israel. But it’s his right to express himself. That’s his view. A screen capture from Avri Gilad’s show today. He cited an example of a distorted Haaretz headline in English, documented by CAMERA. It is true, as Benn says, that the paper often does correct the factual errors that CAMERA raises. The fact that editors are usually willing to correct, raises the question: what are they doing to prevent the ongoing, systemic policy? In other words, why does the problem keep recurring? I still don’t understand, however, why Dichter vented his rage on [Ayman] Odeh. The Joint Arab List leader said in a television interview that while serving as the head of the Shin Bet, Dichter had ordered the assassinations of PLO chief Yasser Arafat and Hamas co-founders Sheikh Ahmad Yassin and Abdel Aziz Rantisi. When all is said and done Odeh merely noted the fact that Dichter had executed people without trial. Actually I would have even expected Dichter to publicly acknowledge these gems from his life’s story. After all, such deeds inspire pride in the Israeli public. Arafat died in a hospital near Paris soon after falling ill in the West Bank. Traces of radioactive polonium were found on his belongings, which French experts later ruled were environmental in nature. The medical report published after Arafat’s death listed the immediate cause as a massive brain hemorrhage resulting from an infection. Doctors ruled out foul play; some contended that Arafat died of AIDS. After the opening of the inquiry, Arafat’s tomb in Ramallah was opened to allow teams of French, Swiss and Russian investigators to collect samples. Earlier today CAMERA’s Israel office contacted Haaretz English edition editors about the baseless charge to request a correction. I entirely reject the claim that there is a bias in the English edition slanted towards greater criticism of Israel, and all of your examples cannot substantiate this claim. CAMERA, to say the least, is a one-sided organization with a specific agenda.It is not at all a body dedicated to accuracy in journalism. If that were the case, its findings would have been different, and apparently balanced. Repeating the response he had earlier given Presspectiva, he launched into an absurd argument that if the paper identifies the Palestinian as a “terrorist,” it must by the same token identify the soldier, who is now facing charges of manslaughter, as a “murderer.” Schocken flat out rejected Dan’s point that while the Palestinian’s attack on the soldier is an undisputed fact, a court is now examining the circumstances surrounding the soldier’s shooting of the Palestinian attacker. 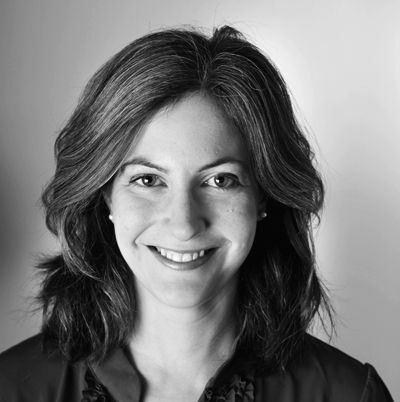 ied the disproportionate influence of the paper abroad and blasted its writers as “post-Zionist radicals, not journalists.” “The freedom of expression does not permit people to lie and to demonize,” said the Yesh Atid MK.